1 Channel Relay Module SMS Call GSM Remote Control Switch Power On or Cut Alam SIM800C STM32F103CB.. 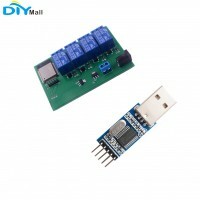 Description:Voltage:6V-18V, when using 6V Power supply, the current need above 1.5ARelay interface: .. Description:5V Omron solid state relays 240V 2A, output with resistive fuse 240V 2A.Input power supp.. Description:Voltage:9V-36V, when using 9V Power supply, the current need above 1ARelay interface: Us..